The 1918 execution of the last Russian Tsar Nicholas II and his wife Alexandra at the hands of Bolsheviks in Yakterinberg has coloured popular understanding and many histories of the Romanov family’s life. Now another chapter has been opened in Romanov mythology with news that Russian investigators are exhuming their bodies to work out whether new remains found in 2007 are those of two of their children, Alexei and Maria. Tsar Nicholas was a young man unsuited to autocratic rule, but utterly determined to uphold his father’s strict authoritarian regime regardless of the need to reform a modernising Russia. The Tsarina was a devoted wife, tormented by the ill-health of her haemophiliac son, embroiled in a scandalous relationship with advisor Grigori Rasputin and keen to make every effort to support her weak husband in his aim of preserving the autocracy. Their lives seem dominated by ominous portents and ill-judged decisions, relentlessly propelling them towards their inevitable fate after the 1917 revolution. In 1896, the Tsar’s coronation was overshadowed by the Khodynka field tragedy when thousands were killed and injured – the royal couple made matters worse by attending a lavish ball later that evening. In 1905, Nicholas granted but then limited democratic reforms. And during World War I, he became commander-in-chief while Alexandra took charge on the home front, advised by Rasputin. Amid all this, the Romanovs had a romantic family life. Nicholas was a devoted and loving husband and father, Alexandra a supportive wife and dedicated mother. Numerous photographs of them with their beautiful daughters and beloved son Alexei highlight the universal aspects of their family life, despite the fabulous wealth and luxury that they enjoyed. The contrast between these perfect images and the chaotic, brutal nature of their execution and the disposal of their bodies ensured that their deaths came to symbolise the violent conflict of the Russian Civil War, and eclipsed the millions of other deaths caused by it. One of the reasons for the enduring mystique surrounding the Romanovs is the range of powerful narratives about their lives created by governments, political factions, the press and the public. In the revolutionary period, there was a perceived gender imbalance at the heart of the autocracy with Alexandra (and Rasputin) being thought to wield female, mystical, foreign and corrupt influence over her husband – the rational, male, Russian leader. This was used by many to explain the rottenness at the heart of the existing order. In the aftermath of Nicholas’s abdication in 1917 and the Romanov family’s imprisonment in the Urals, King George V decided that Britain could not risk offering sanctuary to the Romanov family. He worried that their reputation as a symbol of monarchical oppression would destabilise Britain and radicalise his own people against the royal family and the state. Meanwhile, the Bolsheviks feared that while the Romanovs lived, their White Russian enemies' efforts to destroy the new Soviet state in the civil war would be intensified. Yet the execution and secret burial of the Tsar and his family by Urals Bolsheviks did not fully erase them as a focal point of opposition to the Bolsheviks. The very absence of visible remains ensured that individuals claiming to be Alexis and his sister Anastasia appeared in both the Soviet Union and America, enabling Russians and Westerners alike to dream that the family’s executioners had failed. The Bolsheviks did not make this mistake again, displaying both Lenin and Stalin’s bodies for all to see. These fantasies were reinforced when the first set of Romanov remains were exhumed, identified and found not to include the bones of Alexei and one (unidentified) Romanov daughter. With the fall of the Soviet regime, questions arose about the appropriate way to deal with the Romanov remains. 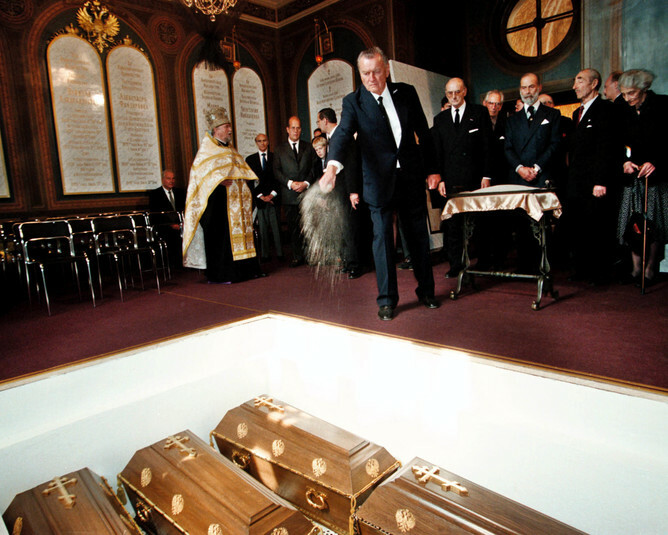 In 1998, Boris Yeltsin attended their controversial burial in the St Peter and Paul Cathedral in St Petersburg, despite the Russian Orthodox Church expressing concern whether the remains had been accurately identified. Yet it, in turn, made the contentious decision in 2000 to canonise the family. The Romanovs’ worthiness was justified on the grounds of their Christian humility in the face of their execution, yet others questioned whether it was appropriate in view of the negative and violent aspects of their regime. 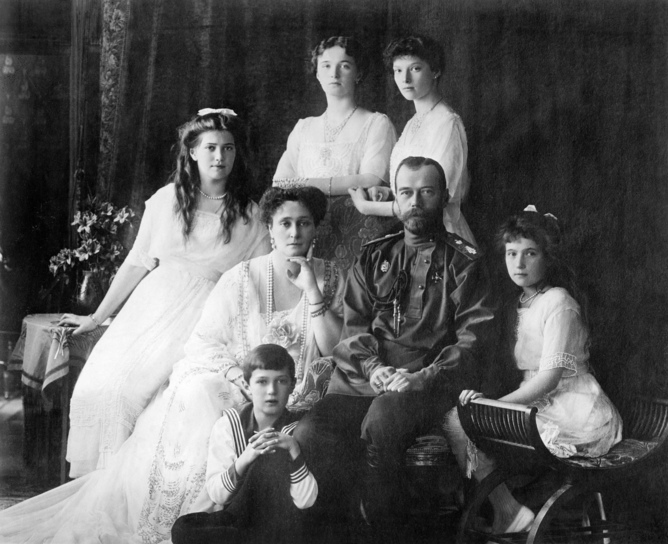 The Church is now determined to ensure that the most recently discovered Romanov remains – found in 2007 – are those of Prince Alexei and, it seems most likely, his sister Maria. It has argued that it is vital for people praying to saints to know that their relics are genuine. It is significant that the state is cooperating in full with these demands, at the same time as some moves have been made to invite the surviving members of the Romanov family to return to Russia. This is happening as the Orthodox Church consolidates its renewed importance in Russian society and the president, Vladimir Putin, forcefully asserts Russia’s significance on the global stage. Once again, powerful groups are seeking to control the enduring symbolic power of the last Tsar of Russia.